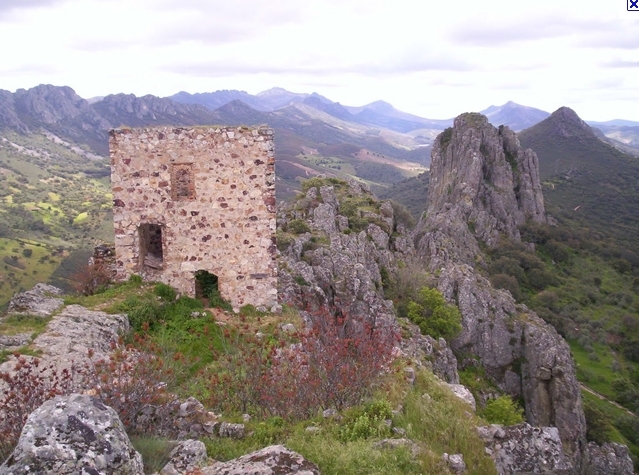 Unspoilt Extremadura and the special Sierra de Montanchez. The Extremadura region of Spain has had a long, hard history. It was difficult to extract a living out of this mountainous and remote area in past ages. Thankfully the very reason for the Extremadura's difficulties in the past is the great advantage it has now. Vast areas of the rest of Spain have been negatively affected by the industrial and tourist ages, beautiful areas decimated by unplanned development, this did not happen in the Extremadura. Here the people have clung on to their ancient traditions and most of all the great love and natural respect for nature. It is evident where ever you travel in this region, the land is cared for lovingly, each tree, each vine , each animal is tended with care from beginning to end. The donkey is still a mighty force in the sierras of the Extremadura. Most of the mountain pastures and arable land , olive and fig groves are connected by a labyrinth of ancient paths, originally laid down by the Moors or even the Romans, these paths are a delight for human and donkey steps, man-made vehicles are impossible...thank goodness! The donkeys wind their way up and down the callejas - paths- with loaded packs of tools for tending the land, seed, manure, and the tired farmer on the way home. Through long experience and much hard work the small holding farmers of the Extremadura have utilized their land most efficiently. The range of products is really impressive and all naturally produced to very high quality. In the Sierra de Montanchez, where Finca Al-manzil is situated, the small black Iberic pigs graze contentedly in the oak forests gorging on the abundant acorns, they produce the famous Montanchez jamon and chorizo. Cows and sheep are left to graze on the mountain pastures, the cheese products are delicious (see food section ). The wine produced in the Extremadura is very characteristic, usually quite strong and full bodied , can be up to 16% . In many towns such as Montanchez the local wine , Pitarra, is still made from the grapes that grow in the mountain vineyards, transported to the musty cellars that exist in most of the old houses and fermented in huge Ali Baba clay pots called tinajas. Extremadura has two mighty rivers flowing through it, the Tajo and the Guadiana. They have been utilized to make many extensive and beautiful lakes, so although far from the sea, there are plenty of watersport and fishing possibilities. The wild sierras, rolling plains and wonderfully atmospheric villages and towns all make for an interesting and restful holiday. Communication is improving to bordering regions with excellent roads to Castille in the north, Portugal to the west, Andalucia to the south. Lisbon and Madrid are both a 3 hours journey, Sevilla 2 ½ hours. The Romans left traces of their passage through this region, building majestic bridges, such as the ones at Mérida and Alcántara, and the spectacular Roman remains of Mérida are world renowned. Caesar's legions were here to mine silver from the ravines of the Sierra de Gata, which borders Extremadura to the north. The so-called Roman Ruta de la Plata, "Silver Route," with its fine roads, bridges, aqueducts, temples and cities was the result of the Romans' quest for this precious metal. 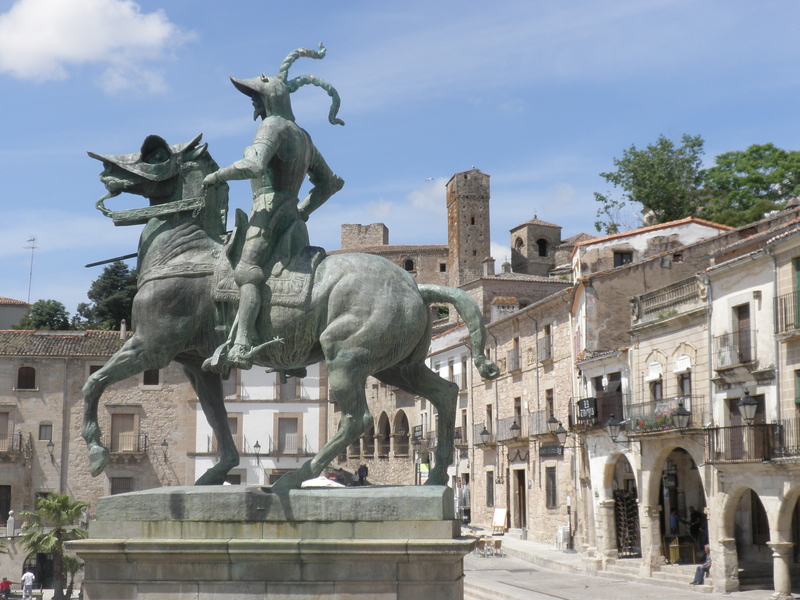 Extremadura is known as the "Cradle of the Conquistadors". Cortés and Pizarro, the best known of a long list of men from Extremadura that also includes Valdivia, Orellana, de Soto and Nuñez de Balboa, took human endurance to new limits as they explored, mapped and charted the recently discovered New World under unthinkably severe conditions. In fact, countless New World cities and towns adopted the names of their counterparts in Extremadura, like Trujillo, Medellín, Guadalupe, and Alburquerque (Spanish spelling). Visitors to Extremadura can tour along the Route of the Conquistadors, which passes through the towns and villages where these explorers were born and bred. The largest village in the Sierra de Montanchez. Dominated by its Moorish castle it is know as the Balcony of the Extremadura because of the splendid, vast views down into the valleys and plains towards Trujillo, the Gredos mountains and Cornalvo natural park. The oldest part of the town is typical of its Moorish heritage, small, narrow streets leading to secluded little courtyards. The life of the village centres around the thriving jamon production. Indeed the local jamon is one of only three recognized in the whole of Spain for its outstanding quality. 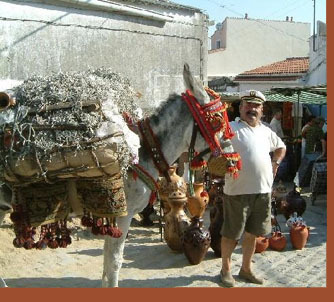 Life is still slow here, the older generation still use their donkeys as the main means of transport to their outlying fincas. The walking, riding and birdwatching (see separate entry) are wonderful experiences due to the lack of urban development in the sierra. The whole sierra is criss-crossed by Moorish trading paths which give access to outstanding areas of unspoilt, natural beauty. At Finca Al-manzil one can appreciate the quiet and peace of the sierra whilst enjoying walking or riding out directly from the finca. The nearest village is Arroyomolinos, 2kms walk or 5 mins drive where the unique ruta de molinos climbs up through a stunning gorge passing numerous ancient watermills. This beautiful town is dominated by a colossal Mudejar style monastery which preserves valuable works of art. It witnessed the documents certifying the departure on the American adventure. And there the first captive Aztecs were baptized. The most famous Marian Sanctuary for all of the Spanish speaking world dates from the miraculous discovery of the image of the Virgin de Guadalupe, the black Madonna, its Patron Saint, around the year 1300. 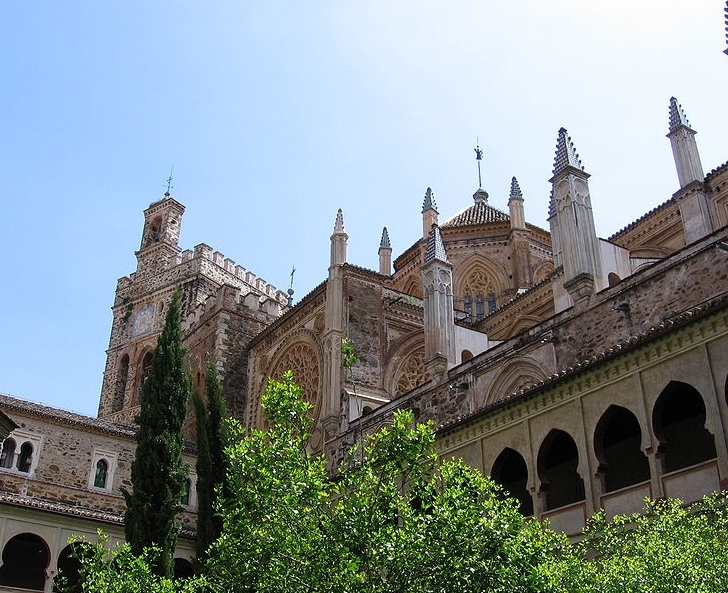 The huge Monastery combines Gothic, Mudejar and Plateresque in unusual grandeur. There are admirable paintings by Juan de Flandes, Zurbarán and Lucas Jordan, apart from the miniatures of its choir books, the rich collection of ornaments and the buildings which used to be a hostelry, hospital and royal fortress. Guadalupe has the Parador called "Zurbarán", which is an invitation to rest after admiring so much beauty. The capital of Extremadura, was one of the most famous Roman capitals of the Iberian Peninsula, – Augusta Emerita, it features some of the best preserved Roman ruins in Europe. Merida was passed between Roman, Moorish, Visigoth and Christian control. It is a fabulous place to walk. Archaeology pops up in the strangest corners, and the Moorish influence adds a grace of its own to the town. Merida preserves some of the most outstanding Roman monuments, including a colossal theatre, an amphitheatre, two aqueducts, and a bridge. A must is the Museum of Roman Art with its invaluable collection representing Roman civilization through amazing mosaic floors, statues, household artefacts and jewellery. Summer visitors can enjoy magical evenings in the Roman theatre under the stars watching top performances of drama, dance and music. The capital of Upper Extremadura has a beautiful old quarter, enclosed by Moorish town walls with great watch-towers. Additional attractions include some exceptional Renaissance palaces. Founded by Romans in 34 BC, this thriving provincial capital is the closest Extremadura comes to a big city. Named a World Heritage City in 1986, the barrio antiguo offers plenty of architectural wonder. Between the 14th and 16th centuries, rival noble families vied for social and political control, each building a miniature palace to demonstrate their power and wealth. As a result, the old city is a wonderful maze of palaces, museums, and churches. Although the more modern areas are less interesting, the Parque del Príncipe and a healthy nightlife scene provide ample amusement for a short stay. 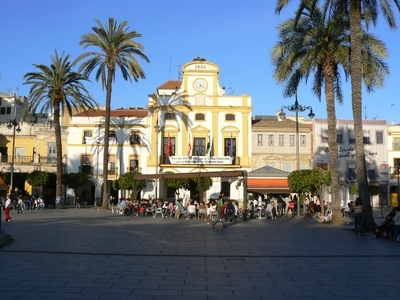 From Cáceres it is possible to enter Portugal by bus or by train via Badajoz or Valencia de Alcántara. The birthplace of famous conqueror Pizarro is well known for its beautiful main square. There is also a great Moorish castle and the well-preserved town-walls with seven gates. 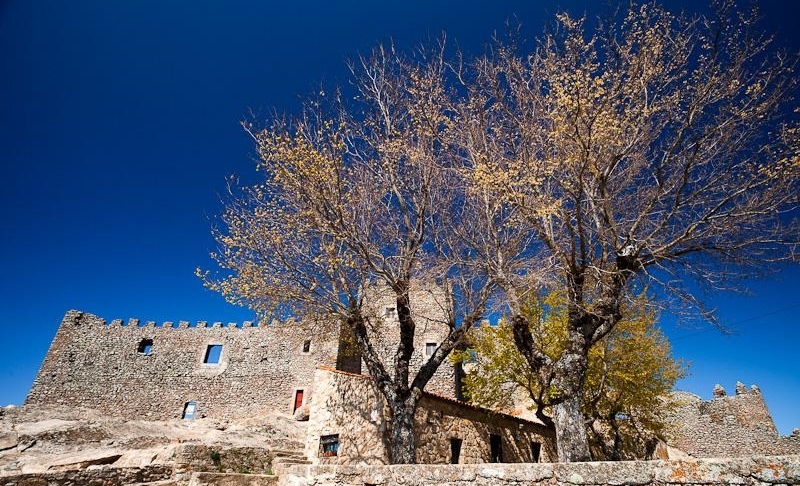 The gem of Extremadura, hill-top Trujillo is an enchanting old-world town unspoiled by modern influences. Trujillo furnished history with over 600 conquistadors, including Peru's conqueror Francisco Pizarro and the Amazon's first European explorer, Francisco de Orellana. Scattered with medieval palaces, Roman ruins, Arabic fortresses, and churches of every era, Trujillo is a hodgepodge of histories and cultures. Its most impressive monument is also its highest: the 10th-century Moorish castle commands a stunning panoramic view of the surrounding plains. Twentieth-century residents take pride in the well-preserved beauty of their churches, palace, and castle, adorning them with lovely gardens and flowering vines. The capital of lower Extremadura nd inside its province is found the capital of the Community of Extremadura, Mérida. The province is the largest in Spain and covers an area of 8,500 square miles (21,757km²). The town lies at an altitude of 186m above sea level on a hillside near where the rivers Rivillas and Guadiana meet. The Portuguese border is only 6 kms from this castle dominated town. There are well preserved Moorish walls and Alcazar. According to Dionisio Pérez, when the convent of San Benito de Alcántara was sieged by the troops of Napoleon, the nuns used the parchment paper of books to make rifle cartridges. Somebody found out that on one of these manuscripts was written the recipes of the convent and sent it to General Junot, who later incorporated the recipes into the French cuisine. In this way, pheasant, woodcock and partridge were served "a la Alcántara" in Parisian palaces. The expert Escoffier, a staunch Gaul, said that this manuscript was "the best trophy, the only profitable thing that France got out of that war". Extremaduran cuisine is simple, tasty and very varied, because it knows how to use the top quality resources it has at its disposal and never tries to hide anything. This has resulted in authentic, natural and uncomplicated dishes. Christians, Muslims and Jews lived together in this region and each left its mark on Extremaduran cooking. The Arab "sinabi" is the precursor of the "caldereta" (meat stew), the Jewish "adefina" is the precursor of the "olla" and "puchero" (other typical stews) and "escabeche" - a pickling brine - was used to prepare food by both cultures and was very popular throughout the region. The most important component of Extremaduran cuisine is the Iberian pig, which produces the best cured hams, jamon, in the world; when used for chorizos the meat is covered with a type of ground pepper known as paprika, which was brought to Spain by the Extremaduran conquistadors . True gastronomic delights are prepared with its fresh meat - "presa" (whole fresh leg), "secreto" , "carrillera" , "botones" etc. Oven-roasted lamb, cooked as "caldereta" or in another type of stew known as "guiso de bodas", represents Extremaduran cooking at its best. Game abounds in this region (partridge, pigeon, turtledove, rabbit, hare, wild boar, deer, etc) and is cooked and served with wild mushrooms, truffles, wild asparagus or the excellent thistle, resulting in a very creative and innovative style of cooking which satisfies modern tastes. The tench is an excellent fish which when properly prepared is sublime. The Extremadurans either marinade it in a pickling brine or pickle, or fry it. This fish is in fierce competition with the trout, another favourite. However, if the Iberian pig is considered exceptional, the "Torta del Casar" is surely the most sought-after cheese in Spain, which together with the other cheeses found in the region - La Serena, Ibores, Gata and Cabra del Tietar, can form part of a cheese board which is difficult to beat. Extremaduran honey is very sweet and varied due to the diversity of the flora found in this area. Thyme, heather, rosemary, lavender, lime and eucalyptus are used to prepare a great variety of desserts by mixing them with almonds, walnuts, pine nuts, eggs and flour and sometimes a glass of anise or other liqueur to make "rosquillas" (ring-shaped biscuits), "alfeñiques" (caramel dessert), "perrunillas" (small round cakes), "nuégados" (egg yolk and orange), buns, "técula-mécula" (cinnamon, almond and tea). There is one Denomination of Origin: Ribera del Guadiana. Extremaduran wine is still not very well known, but the advances made with regards its quality are notable. The house wine at Finca al-manzil is from the Mirabel bodega in Trujillo which has a selection of great wines from the everyday table wine to some real treats. Aldebarán, located in the main square of Badajoz has certain traditional Extremaduran dishes on its menu which are prepared using local products. Torre de Sandes in the old part of Caceres is also good , especially in summer as there is a charming, ancient courtyard for eating outside. In Trujillo any of the restaurants in the main plaza are good and also Dos Orillas which is situated in an old house with courtyard.